The aim of the class is to perform both seated and standing exercises, depending on participants’ ability. Exercises are specially designed to strengthen muscles and bones, improve balance and flexibility and generally make you feel fitter so you will find it easier to carry out everyday tasks. 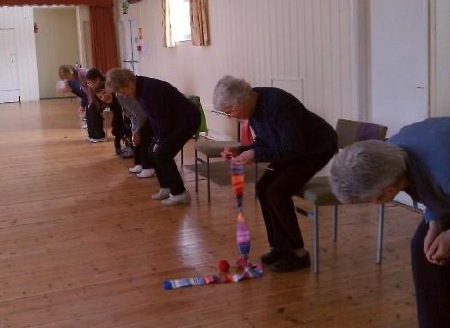 Coastal fitness focuses on delivering exercise to older adults in community settings, such as a village hall, sheltered accommodation or residential homes. Classes can also be delivered in at home if this is more convenient. Sessions typically last 60 minutes. You may find some of the exercises difficult at first, but with practice they will become easier. Exercises are performed both to music, with resistance bands and ankle weights. Be prepared to perform the exercises at your own pace and do not try to keep up with the more experienced or fitter members of the group. You will be asked to complete a simple health questionnaire prior to attending the class, so the exercise leader can take into account any special medical conditions you may have. Do not exercise if you feel unwell.